Bomb damage in Leicester due to the Luftwaffe attacks of 19 November 1940. Italian/Greek Campaign: The Greek advance, which sputtered a bit on the 18th, resumes on 19 November 1940 in the Korçë plateau area. The Greek K Group under Lieutenant-General Georgios Kosmas make progress in capturing the summit of Moravia, which provides a commanding perspective over the surrounding region. The Italians fight hard to keep the summit, but give ground. In northwestern Greece, the Greeks push the Italians back across the Kalamas River. The Greek Liuba Detachment begins crossing the Kalamas River in the Thesprotia sector. In the Kalamas Sector, the Greek 8th Division continues on the offensive. In the Negrades sector, the Greek 2nd Infantry Division captures Agios Kosmas. The Greek and Italian air forces engage in heavy combat over the Koritsa fighting. European Air Operations: The Luftwaffe is fairly quiet during daylight hours. The Germans have realized that night-time operations are much less costly. They also can be devastating, as proven today. The Luftwaffe sends 350 bombers from KG 26, KG 54, KG 55 and KuFlGr 606 against Birmingham in a first wave, then 116 in a second. They drop 403 tons of high explosives and 810 incendiary bombs. There are about 900 killed and 2000 injured. The Luftwaffe loses five planes, one of them brought down by a Beaufighter of RAF No. 604 Squadron that makes the first radar victory of the war. While this attack is not given nearly as much prominence in accounts of the war as the 14 November 1940 attack on Coventry, it kills and injures many more people. In addition, Birmingham Cathedral is damaged, just as Coventry Cathedral was. The Luftwaffe has honed its nighttime bombing technique, using pathfinders from KG 100 that drop flares and sophisticated guidance techniques that the British continue to have difficulty jamming. 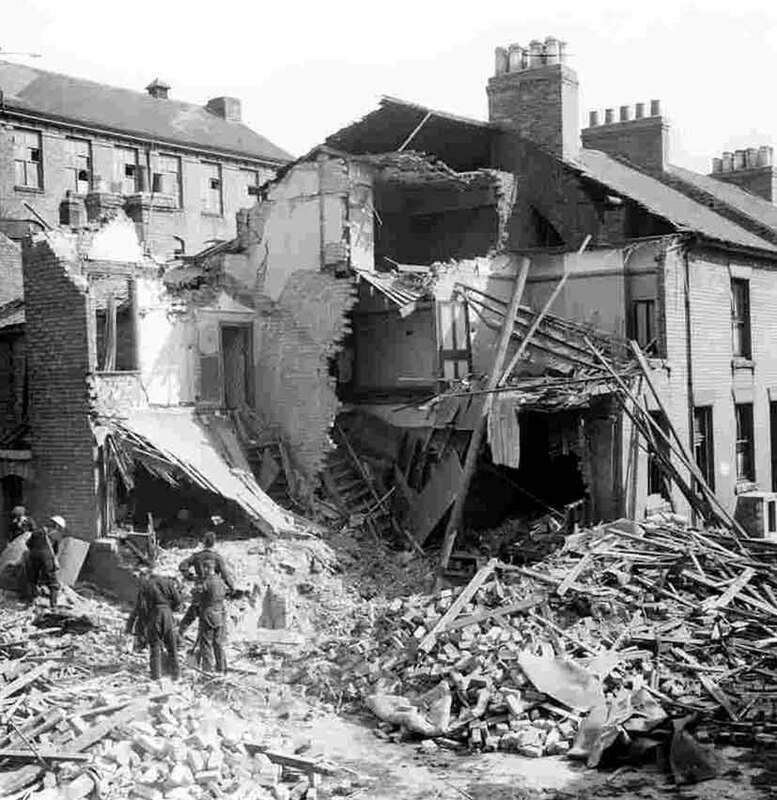 The Luftwaffe also bombs Leicester, England. They drop 150 high explosives which destroy 255 homes, 56 businesses, kill 108 people and seriously injure another 284. The RAF bombs the Skoda armaments plant at Pilsen, Czechoslovakia, but bombing accuracy is poor. 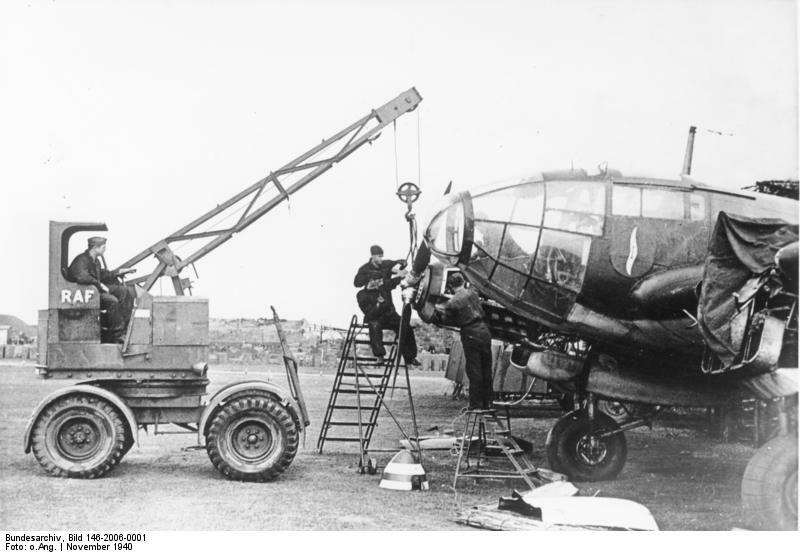 A Heinkel He 111 being repaired with a captured RAF crane, November 1940 (Ang, Federal Archive). Battle of the Atlantic: The weather is rough in the English Channel throughout the day, restricting shipping attacks. The Luftwaffe bombs and sinks 276 ton Royal Navy trawler HMT Fontenoy (T/Skipper John Couch Coaker, RNR) in the North Sea off Lowestoft, Suffolk. Everyone survives. The Fontenoy is a converted fishing boat taken over by the Admiralty in February 1940. Destroyers HMS Campbell and Garth ambush Kriegsmarine E-boats S-7, S-38 and S-54 whilst on patrol in the Thames Estuary. One of the destroyers rams and sinks 115 ton S-38. The Luftwaffe attacks Convoy WN 40 in the North Sea, but the defending cruiser HMS Curacoa and escorting RAF Blenheims drive off the attacking planes. The Luftwaffe damages 1166 ton British freighter Folda in the North Sea. Convoy OG 46 departs from Liverpool, Convoy FS 339 departs from Methil, Convoy SLS 56 departs from Freetown and rendezvouses with Convoy SL 56, Convoy BS 9 departs from Suez bound for Aden. Canadian corvettes HMCS Collingwood (K 180), Freesia (K 43) and Hollyhock (K 64) are commissioned. Battle of the Mediterranean: A light cruiser, HMS Newcastle, arrives at Malta carrying supplies and 200 airmen. This is part of Operation White, which saw only 4 of 12 Hurricanes make it to Malta from HMS Argus on the 18th. The Newcastle proceeds on to Alexandria. Royal Navy cruiser HMS York arrives at Suda Bay, Crete with a battalion of British troops. This frees up Greek troops for the fighting in the north. An inquiry is launched into the loss of the 8 Hurricane fighters that had been launched from HMS Argus on the 18th but failed to make it to shore. The "emergency investigation" led by First Sea Lord Admiral Sir Dudley Pound blames the weather for missed communications, but also notes that the planes had too small a margin of fuel. The report also notes that the planes flew off from the aircraft carrier 40 miles further west from Malta than during Operation Hurry due to fears of Italian fleet operations. Spy Stuff: Noor Inayat Khan, of an Indian Muslim family by way of Russia, joins the Women's Auxiliary Air Force (WAAF) and, as an aircraftwoman 2nd class, is sent to be trained as a wireless operator. German/Spanish Relations: In meetings with Spanish Foreign Minister Serrano Suner, Adolf Hitler presses for Spain to join the Axis so that they can mount Operation Felix, the assault on Gibraltar. Serrano, however, responds that Spain would require 400,000 tons of grain before entering the war. This is a continuation of tactics that the Spaniards employed at Hendaye in October which show they are not ready to join the war. As described in the 19 November 1940 Look Magazine, the Panoram is the trademark name of a visual jukebox. The jukebox plays a closed-loop 16 mm film reel projected on a glas screen, and you can see it after putting in a coin. This is an early form of the music video. 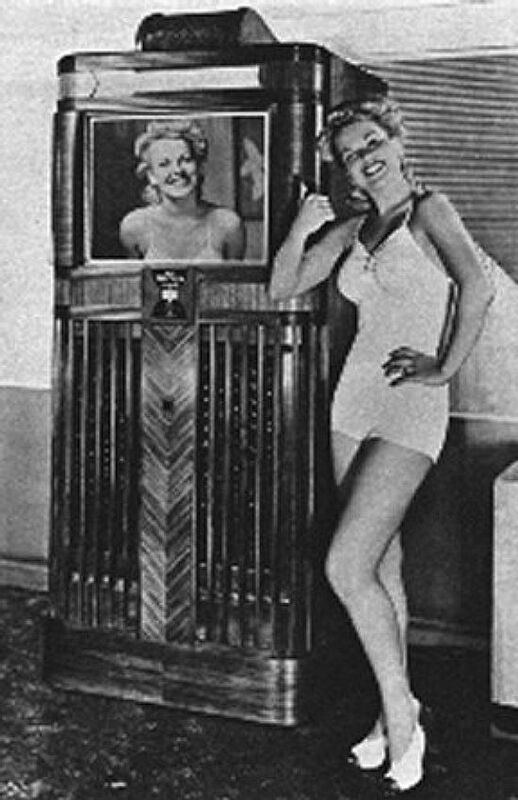 The idea was stunted due to the outbreak of World War II, but similar machines finally reappeared during the 1960s. President Roosevelt's son James is one of the backers of the Panoram in RCM Productions. Some of these shorts survive on youtube. German/Belgian Relations: Hitler continues with his round of diplomatic meetings by receiving King Leopold of Belgium. Many in Belgium are growing unhappy with the King, feeling that he is a bit too comfortable with the Germans. German Military: Following his meeting on the 18th with Italian Foreign Minister Count Ciano, Adolf Hitler refines his plans for an invasion of Greece (Operation Marita). Previously, he had been thinking of simply occupying the northern portion of the country, securing the Aegean coast and as a means of rescuing the Italians advancing (or now retreating) in the northwest. Now, he decides to expand the scope of the invasion to include the entire mainland. This requires a great expansion in the forces allocated to the operation, which up to this point have been only a little more than a strengthened corps. While this may seem like a relatively obvious and almost natural change - Hitler always expands the scope of operations when he can - the change causes grumbling within the Wehrmacht. The Army (Heer, led by the OKH) is far along with its plans for an invasion of Greece from Bulgaria, and feels as if it is being given unclear directives by the Military Staff (OKW) which complicate its task. This OKH/OKW tension will remain throughout the war. OKH Chief of Staff Franz Halder begins revising the plans for the Greece invasion while complaining in his diary about the "deficient connections between ourselves and OKW." Not everybody thinks that new commitments in the Balkans would be a good idea. One thing weighing in favor of invading Greece in Hitler's mind is the new presence of RAF bases in Greece, which threaten his Romanian oil supply. Isolating Great Britain is at the heart of all this planning. There are many ways to do this: Hitler also expresses some renewed interest in Operation Sealion, which would be a more direct way of getting at the British Empire than a time-consuming march through the Balkans (and, later, the Soviet Union and North Africa, because all of these operations will flow from the same wellspring). However, the Italian disaster in Albania requires some sort of solution that Operation Sealion could not provide. The Rose Room Ballroom in Oakland, California. It was a taxi dancing hall at 409 12th Street. Taxi dancers were paid by the song. US Military: Cruiser USS Houston arrives in Manila to serve as the US Asiatic Fleet's flagship. British Military: De Havilland completes prototype E0234, the Mosquito bomber at Hatfield. This prototype undergoes successful engine runs (two Merlin 21 two-speed single-stage supercharged engines driving three-bladed de Havilland Hydromatic constant-speed, controllable-pitch propellers. The prototype remains to be flight-tested. This is not the final form of the aircraft, as it has Handley Page slats on the outer leading wing edges. Canada: The Canadian government approves the start of germ warfare production. Switzerland: Federal Police close down Kellers NBS, including its 160 chartered cells involving nearly 4,000 members. Kellers NBS is a far-right organization led by Dr. Max Leo Keller and Rolf Henne which wishes to see Switzerland annexed by Germany. The group, working through its cells and financed by Heinrich Himmler's SS, continues to work underground. 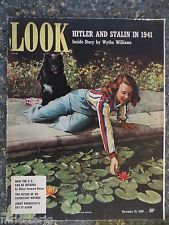 Look Magazine, 19 November 1940.